Do you ever have a handful or projects in your mind that you think could be successful but know it would take a little bit of work to get out? I think I have a handful in my head right now. I think they’re each doable. I think they each possess a good deal of marketability. And each would be fun to embark upon. Of course they each would take a little bit of time. But though it’s not necessarily the goal of these projects, I think even a little bit of money could be made from them. At least to pay for the effort and time put into them. But I always get caught up in making little decisions about details to actually launch them. Little things that, while they’re “big deals”, really won’t affect the outcome. It’s like if I were trying to build a dog house to go in my back yard, but I’m standing in Home Depot trying to make the decision on the “right hammer” for the job. In the end, the dog house will probably look and work just the same as long as I have a good plan in place and do good work. 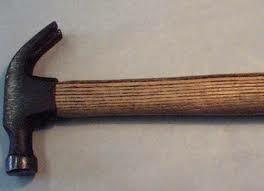 The make and model of the hammer probably wouldn’t matter too greatly. But it’s things like this that I stumble over and get caught up in over analysis. So…that said, I think I’m typing this to give myself a boost. Give myself a public calling out of sorts. Either move forward with the idea(s) or drop them.